The Kona-One racing class has a unique rig developed to balance sailor weights to sail sizing. This sail size limit for weight of users, levels the playing field among competitors. This chart can be found on Kona's website located HERE. ONE Design Sails All Kona rigs are tailor made to cater for specific body weights. Light weight Monofilm, XPlycombination sails with Dacron patches in stress areas. All supplied with the Kona insignia and graphics. Masts, booms and extensions are of superior quality and carefully tuned to fit the sail sizes. The Kona 9.8 Sail Rig is a great all around sail and performs extremely well in all types of conditions. This sail rig was featured in the 2016 Kona Worlds, it was brand new at the start of the event and was only used a few times. 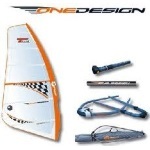 This sail rig is in prime condition and is practically brand new!